Independent Learning. The Montessori system of learning allows students to move at their own speed through the curriculum. There is no need to wait for the other students to grasp a concept. Students work at a pace that fits them. Mixed Age Grouping. Students are placed in the same class for a period of three years. Each class contains three levels of students. This mixed age grouping, along with the consistency of classroom and teacher, allows the students greater flexibility in working at their true academic level. Smaller Teacher to Child Ratios. The average size of our Montessori classrooms is 24 students. Each class is led by a certified Montessori trained teacher and an assistant. Thus, the average ratio is 12 to 1. This lower ratio allows teachers more time to work individually with each student. Academically Challenging Curriculum. 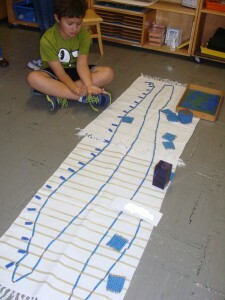 The Montessori curriculum is a hands-on, multi-sensory approach to learning. Students are introduced early to mathematics and language concepts. This early introduction allows students to move into higher levels of learning than normally expected of a child. Specialized Materials and Approaches. Montessori materials have been specially designed to introduce concepts at a level appropriate to a child’s stage of development. Fostering a Love of Learning. Students in the Montessori environment are encouraged to explore areas of interest and develop skills naturally from that exploration. The curious and questioning mind that develops as a result of this approach creates a strong foundation. Students graduating from our program are enthusiastic and motivated learners.